I love books, but once in awhile you will come across a book like this that is very memorable. 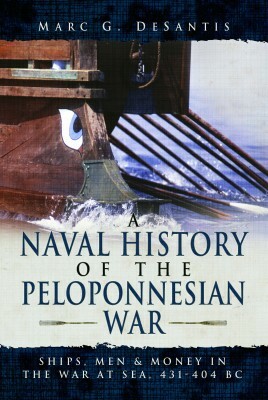 The Peloponnesian War was one of the seminal conflicts in the history of the Western World. It is hard for us to imagine, but Athens was able to bloody the nose of the Persian Empire. This is after the events of the last Persian invasion of Greece. In the process, she gained numerous allies in her fight against the Persians. Athens had a chance to lead, and did for a bit, a crusade against the Great Kings. Unfortunately in her hubris Athens started to look at her allies as conquered people belonging to an Athenian Empire. Without this, Sparta would never have been able to fight a war to 'free the Greeks' from Athenian despotism. In a nutshell, this is the cause of the war. There were many other smaller reasons that also made the Peloponnesian War seem inevitable. It might also have been possible that if the Greeks had not fought each other to exhaustion, that Macedon would still have remained a backwater. This book is filled with everything a history lover would like to know about the era. From its in depth delving into the monetary cost and upkeep of the navies, to the actual tactics used by both sides during the war, it is all here. The actual history of the trireme is shown to the reader. The author also goes into the day to day maintenance of the ships; from why too dry ships were slower, to the Teredo Navalis (shipworm), it is in the book. How many talents Athens had on hand at the beginning of the war is shown. Then it is broken down to show how long this surplus would last under wartime conditions. On hand cash, is shown to be as important in warfare then as it is now. The reader will see how the massive funds, although dribbled out to Sparta, of the Persian Empire helped to tip the scales against Athens. This war has had many books written about it. In actuality Thucydides, an Athenian general, wrote the first history of the war. The book we are looking at is one of the best on the subject, but also one of the best books about any war. As the author points out, Greece's coastline is actually longer than Italy's. So almost all of the fighting took place fifty miles or less near the Aegean or Ionian Seas. This was a well written and fascinating book on ancient warfare. From the physical problems that the rowers themselves endured (read for yourself), to how the Corinthians strengthened their bows, it is in this book. I am looking forward to reading more from the author.